Two newly established scholarships in memory of Hugh Moore and Jim Campbell will be given to qualified applicants annually in the amount of $1,000. Applicants must be presently enrolled in a college or university, or have a letter of acceptance to a college or university in a program of at least two years’ duration. Contact: Donald D. Campbell, CCEF Secretary, 4031 Ellicott Street, Alexandria, VA 22304-1011 for more details. $7,500 awarded to US citizens for graduate study at a Scottish university. The James E. Crockett Educational and Charitable Trust has been established in order to promote the happy relationship now existing between Scotland and the United States. The Trust will offer a scholarship of $5,000.00 for graduate study during the next academic year at one of the following Scottish universities: University of Aberdeen, St. Andrews University, University of Edinburgh or University of Glasgow. Applications should be mailed to the Secretary of the Trust, James A. Crockett, 1317 North Palmway, Lake Worth, Florida 33460 so as to be received on or before February 1 of the year in which the academic year begins. The Illinois Saint Andrew Society is pleased to sponsor this scholarship program which honors the legacy of R. Harper Brown, Illinois Saint Andrew Society Governor, Clansman of the year and co-Chair of the Kith and Kin campaign. The purpose of this Scholarship Fund is to assist in defraying the cost of an American student’s study at a university in Scotland. Eligibility: At least a graduating senior in high school with an acceptance and intention to attend university in Scotland or a student at an accredited American college or university looking for a study abroad experience. 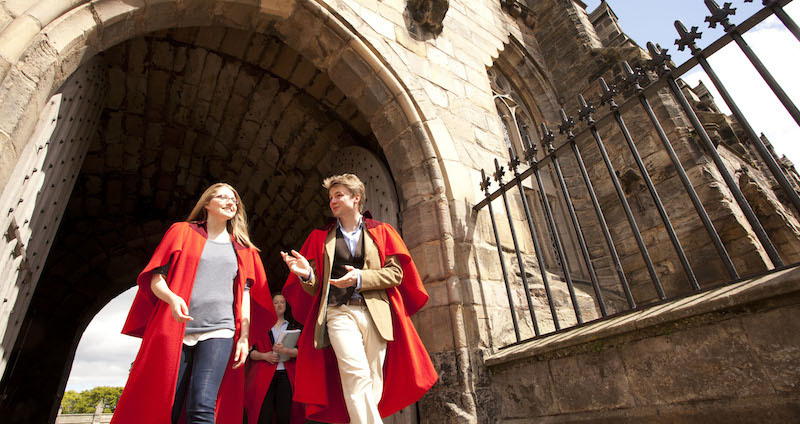 For students from North America who will be studying at St Andrews for a one year Masters degree. There are three postgraduate scholarships covering full tuition fees for each year of study, full accommodation fees in University accommodation (or comparable fees towards private costs), a fixed travel allowance and a book allowance. The deadline for applications is 28 February each year. Application forms and further details of the award can be found on the Ransome Trust Scholarship website. Open to students of Scottish or American descent who have graduated from an American university and have a New York address. Students will be required to study at any university in Scotland for one year. For further information, please see http://www.standrewsny.org. The closing date is 1 December each year. Several awards are available for postgraduate study. Please see the Society website for further information. The US-UK Fulbright Commission provides scholarships to qualified US citizens who wish to study at at an educational institution in the UK. Up to 9 awards are available each year for the first year of masters or PhD study. The Commission looks for evidence of academic excellence, leadership, outstanding references and strong reasons for coming to the UK. Candidates will be selected by the US-UK Fulbright Commission and the Institute of International Education (IIE) to receive grants to be used towards tuition fees and maintenance costs in their first year of postgraduate study in the UK. Awards are also available for academics and professionals who wish to lecture, study and/or conduct research in the UK. Please consult the Fulbright Commission Website for further information. Providing your children with stable and high quality education can be quite difficult at times, especially if you’re relocating from country to country. International tutoring is an effective method of guaranteeing your children are being educated no matter what the circumstance. If you want to find out more about the key benefits of international tutoring and how it can have a positive impact on your child’s development, then find out more here.